OK, so we have already covered more “natural” cooking when you are in the wilds or at the mercy of a disaster or emergency . Then I gave you a compact versatile option for cooking your pot of stew. Now I am going to give you a far more conventional option that allows you to cook really good stuff and to do so easily. A real stove! Well, maybe a semi-real or para-real stove option. 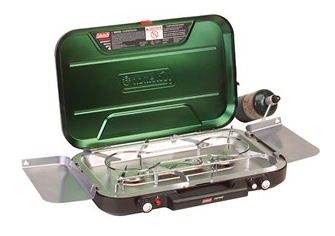 The Coleman EvenTemp InstaStart 3-Burner Propane Stove is top notch in my opinion and a great option for cooking when sheltering in-place or when you have transportation to a place of safety. This camp stove is a modern marvel in so many ways. But to me, it is a winner because it gives you a real solution for pancakes! Seriously, this camp stove gives so many more options to cook food that your family may be a little more use to. And keeping the kids happy can mean a whole lot in an emergency or disaster situation. 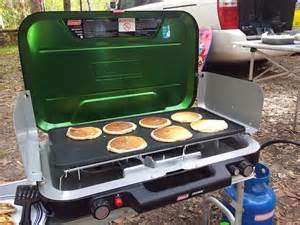 Let’s cover the basics first – the stove is 24” wide so it gives you plenty of room for your favorite griddle. And since there are three burners you can have even heat distributed over the entire cooking surface. Next, three burners – you can cook three different things at one time in different pots and pans if you like. That’s for you gourmet chefs doing a multi-course meal. A very cool feature of the stove is the 3-sided wind screens. The screens protect the flame and your food. If you have ever tried to cook in the wind you know how valuable this feature is. And if you look closely at the picture to the above-right you will see a blue propane tank on the ground. Yes, that is for the stove. This stove has two options for the propane supply. First option is the standard camp stove propane bottle you see to the left. They are normally about 4” in diameter and 8” tall. They are called 16oz bottles. 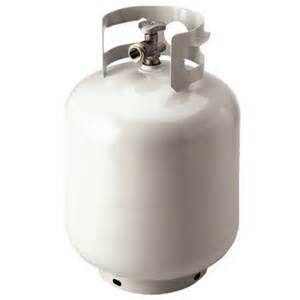 These are great sized bottles for camping, but for emergency situations where you are sheltering in place at home a great option is a 20lb propane tank or larger. This sized tank gives you plenty of cooking time and eases storing of a larger quantity of fuel for your Coleman stove. 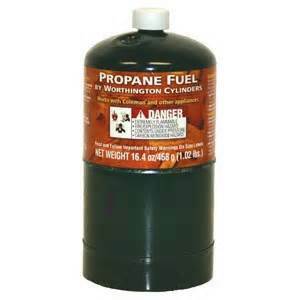 I try to keep a minimum of 10 smaller (16oz) propane bottles on hand. And since my BBQ grill uses the 20lb size propane tank I keep four of the larger tanks on-hand, with usually only one empty at any given time. To use the 20lb propane tank you need to use an adapter with hose. Any store that sells the 20lb tanks should have the hose and adapters. I use a 12’ hose just to give me some flexibility when I set up the stove. The hose will only cost about $20 and well worth the money.